The rooms are furnished in style, with beds and furniture of last century and they give a dive in the atmospheres of past once. 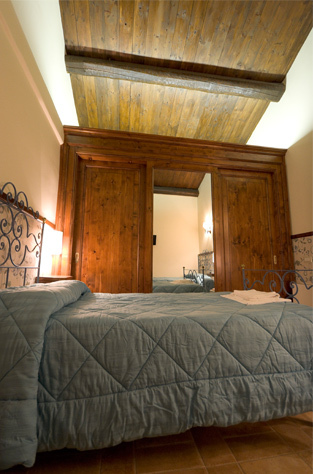 The seven rooms of the Cipolla d’Oro, divided into two floors, are comfortingly furnished, endowed with private bath with shower. They are of different typologies, to satisfy fully our guests' demands: single, double, triple and quadruple rooms, ideal for an holiday together with the family. The cordiality and the family atmosphere guarantee a pleasant and serene stay to the client. Every morning, in the room of the restaurant we offer a rich buffet for breakfast, where the choice of sweets of the greediest tradition Italian pasticceria with fresh brioches is completed by a big variety of affected, fresh sandwiches, yogurt, fruit of season and accompanied by fruit's juices, coffee and cappuccini to satisfy the early-morning habits of all our guests.